New Zealand had become favourites for the World Cup over the course of the tournament, winning their first seven matches on the bounce with innovative strategies. Pakistan, meanwhile, had needed the weather gods to escape a desperately early elimination, although they were the only team to beat New Zealand in the group stage. When the two sides met again, New Zealand opted to bat first and posted an intimidating 262, spurred on by 91 from their talismanic captain Martin Crowe and a half-century from Ken Rutherford. No one among the Pakistan bowlers copped more punishment than their own charismatic skipper, Imran Khan, who conceded 59 in ten wicketless overs. While chasing, Pakistan were in trouble at 140 for 4, with the run rate climbing. It required an innings of a lifetime from 22-year old Inzamam-ul-Haq to drag them back into it. His stunning 60 off just 37 balls took Pakistan close, as Crowe watched from the dressing room, missing the second innings after injuring his hamstring while batting. When Inzamam was run out, Pakistan still needed a further 36 from five overs. It wasn't until a six from Moin Khan in the penultimate over that victory was assured in front of an anguished Auckland crowd, who had been ready to serenade their side to the final. 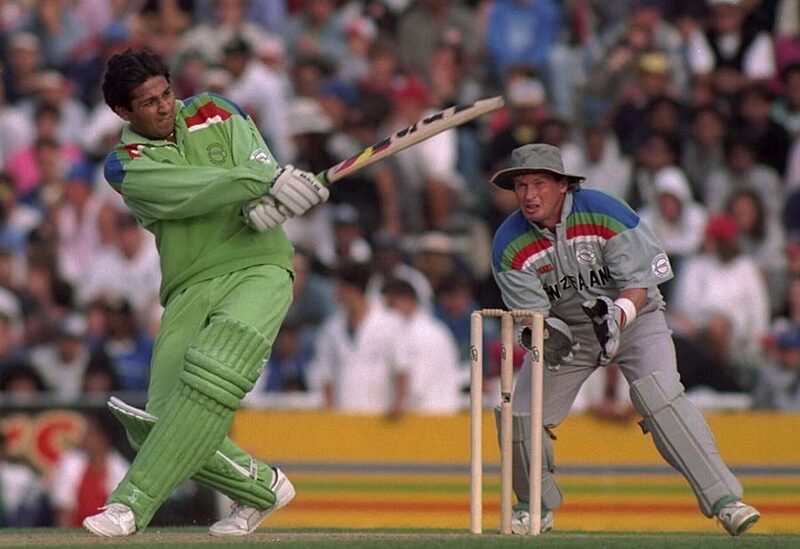 This was the match that shaped the career of Pakistan's greatest ODI run scorer. For many, the claim that Inzamam is the best batsman Pakistan ever produced is simply a statement of fact. He was a long way from that, though, when he walked out to bat that day in Auckland, having been forced by Imran to play despite a dodgy stomach. Is it also the game responsible for Pakistan's current prime minister? Imran Khan, retiring after the tournament, bulletproofed his iconic status by lifting the World Cup. But for a coming-of-age innings by a young man and the holding of nerves by players under agonising pressure, it might so easily have been a more complicated legacy. "When I was going in, Imran Khan told me to play my natural game. It just so happened, whatever I tried that day was coming off. The run rate was up to eight, and the team's requirements gave me the chance to play freely. Martin Crowe once blamed the defeat on John Wright, the stand-in captain, getting his tactics wrong, but I think that shouldn't be the focus. It would be better to acknowledge Pakistan just played very well."